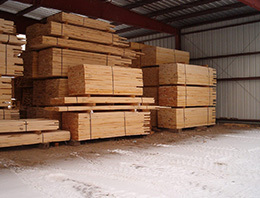 Cannonsville Lumber Inc. is dedicated to the task of providing it's customers with the finest quality forest products from the Catskill Region. A sensible approach to nature while professionally meeting the needs of the market is the hallmark of Cannonsville. "No tree before it's time", quotes owners Adolf Schaefer Jr and Larry Schaefer "We take Only what the forest allows. The idea of taking everything from the forest belongs in the past. The natural habitat must be maintained. Our Future depends on it. 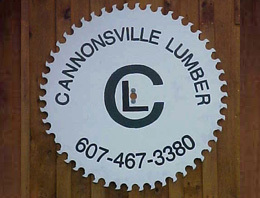 Cannonsville Lumber Inc. is a forest products company that produces green lumber. Our production consists of native hardwood and softwood for custom orders. Logs are supplied to the mill from the purchase of logs and standing timber within a 100 mile radius of Deposit New York. Industrial customers range from furniture cabinets and flooring manufactures to concentration yards throughout the United States and Canada. Custom orders in softwood and hardwoods range from the local person needing a few boards to contractors needing thousands of boards Cherry, Red Oak, Red (soft) Maple, and Sugar ( hard) Maple are the predominant hardwood species sawn. Smaller quantities of Basswood, Ash, Hickory, Birch, and Beech are sawn throughout the year. White Pine and Hemlock are the primary softwoods that we use for custom softwood orders. Support for the forest products industry is essential to the overall vitality of the industry. No single company can afford to stand alone and expect to remain competitive.